The right protein bars make great travel snacks. These are our top picks. Protein bars can be the perfect travel snack option for travelers who care about their health and fitness. Choosing the right protein bars can be tricky if you're not paying enough attention to the ingredients. Many protein bars are nothing more than candy bars in disguise. So what should you be looking for in a protein bar? The most important factor is carefully reading the ingredients. "Many protein bars have a lot of junk added to them," says Mitzi Dulan, RD, CSSC, team nutritionist for the Kansas City Royals and CLIF Nutrition Partner. The less ingredients, the better. Many protein bars contain around 20 ingredients in them; far too many. Stick to the ones with 3-10 ingredients and contain nothing that you don't recognize. Still unsure what protein bars you should pack for your next trip? Here are a few that you can enjoy while traveling and not worry that you're eating a chemical-laden sugar bomb. RXBAR has developed an amazing protein bar that is made from only real food, tastes great and contains no unnatural processed garbage. You won't find any ingredients here that you can't pronounce and have no idea what they are. Ingredients: Egg whites, almonds, cashews, dates, cacao, sea salt, natural chocolate flavor. Get your RXBARs at Vitamin Shoppe with FREE shipping on orders over $25. Epic Performance Bars are made from simple, non-GMO ingredients and protein from cage-free egg whites, while Epic Bars combine grass-fed protein with dried fruit to create a Paleo-friendly travel snack. They both contain around twelve grams of protein per bar and taste great (similiar to RXBAR). Epic Performance Bars are gluten and soy free. Ingredients: Dates, peanuts, egg whites, unsweetened chocolate, peanut oil, and sea salt. I know what you're saying to yourself right now. Cricket flour? Yes you read that correctly. Before you decide to skip this one, hear me out. It's not as bad as it sounds. EXO protein bars do not taste like bugs and the benefits of insect-based food has been gaining some serious traction in recent years. Get ready for a quality snack, increased energy and mental clarity if you decide to give these a shot. Exo protein bars are now available on some JetBlue flights. Ingredients: Peanuts, strawberries, apricots, cricket flour, gluten-free oats, ground flaxseeds, puffed brown rice, honey, vanilla extract, sea salt. Want to know more about eating healthy while traveling? Get Fit For Travel! Macrobar, made by GoMacro, contains minimal ingredients, is all organic and uses plant-based protein to provide you with a great, healthy travel snack option. They taste great: soft, sweet and chewy. The only downsides are they can be pricey and do not contain as much protein as the other bars listed here. Still, MacroBars are a great snack to bring on your next trip. Ingredients: Organic brown rice syrup, organic almond butter, organic protein blend, organic bananas, organic puffed brown rice, organic sunflower seeds, organic walnuts, organic coconut sugar, organic cinnamon, organic natural banana flavor. Quest Bars have some good things going for them. The list of ingredients is short, there’s no added sugar, they’re gluten free, and they taste good. There’s also a wide variety of flavors (over twenty that we know of), so if you don’t like one, there are plenty of others you might like or even fall in love with. 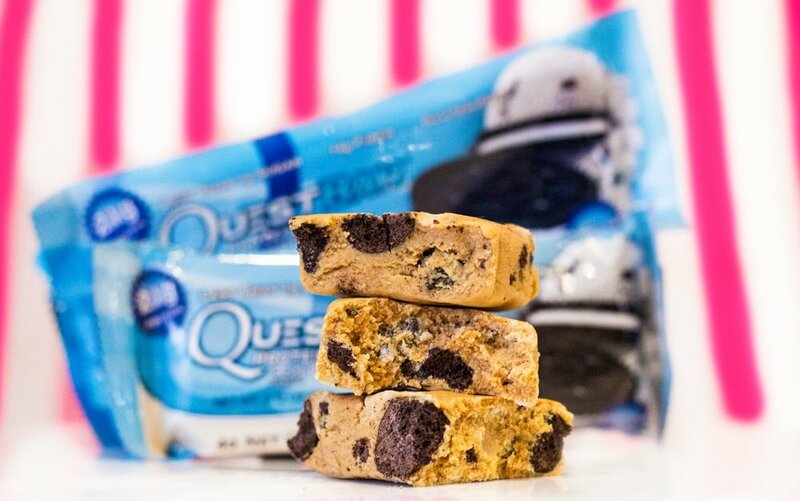 Like RXBAR, Quest Bar has exploded in popularity in recent years thanks to clever marketing and heavy use of Instagram. Get your Quest Bars at Vitamin Shoppe with FREE shipping on orders over $25. Packing healthy snacks will help you avoid making bad food decisions while you travel. It's half the battle in staying fit while traveling. Carefully check the ingredients. Remember that there should be ten or less listed and nothing that you don't recognize.